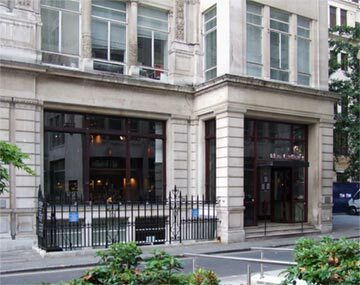 Tucked away off Old Broad Street, just a short walk from the Bank of England you will find Austin Friars and The Gallery. From the stable of Lewis & Clarke city venues, The Galery has a reputation to keep up and the elegance of the location is already a very good start. The standard of decor is high throughout, a delicious blend of rich red and dark wood, nature and modern. At the bar you can endulge yourself in many types of beer, even cask ales are available, although they are somewhat colder than I would like. As with other Lewis & Clarke venues the kitchen is on view, which I feel adds nicely to the dining experience and makes the kitchen staff feel more of the presenation team then simply the back room staff. From the lunch menu, starters are around £6 and a main £12. The name, Austin Friars is a corruption of Augustinian Friars, a priory founded in 1243 by Humphrey de Bohun, Earl of Essex. Across the road from The Gallery you can find the Dutch church which was rebuilt in 1954 after being destroyed during one of the many bombardments of the city during world war II. The origin of the Dutch Church goes back to the 1550. In that year the English King Edward VI gave protestant refugees from the Netherlands permission to establish their own parish. For their worship they could make use of the nave of the church that had belonged to the Augustine monks (Austin Friars).